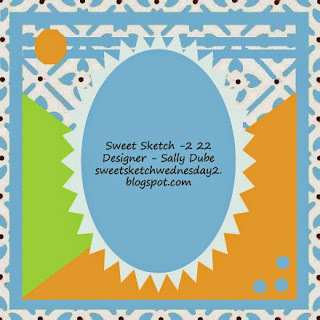 The title of the Sweet Sketch Wednesday 2 post for this week is Sweet sketch Hump Day. I hope I don't have too much of the hump when I go back to work tomorrow after 2 lovely weeks in Italy. I am sure I will miss the almost daily gelato and occasional siesta. Here's a picture of the lovely Villa Balbianello, used as the private clinic in the James Bond film Casino Royale, no sign of Daniel Craig though. It is for Martins nephew who has a birthday next weekend and I knew I would have it to make when we got back. I have a few male birthdays coming up so I am hoping that the male card inspiration is in better evidence than it was before we went away. For the main image I have combined a couple of stamps that were free in a magazine once, I did a bit of masking and then coloured with my Copics. The papers are My Minds Eye On the Bright side, twine and black card is American Crafts and the brads have been in my box so long I can't remember where they came from. Oh Anne looks like you had a wonderful holiday, I so wish for warm weather here. We're having very frosty mornings and wonderful sunny days I can't wait for summer. Love your card and what great images you put together. Love your card and design papers. Your nephew will love it. Great card and thanks so much for joining us this week over at Sweet Sketch Wednesday 2 and good luck. Positively perfect!! A great masculine card. Those papers are wonderful with your image. Thanks for joining us at Sweet Sketch Wednesday 2. Looks like a wonderful holiday. What a cute rockN birthday card. Thanks for joining us. This is such a fun card for a boy! The papers couldn't be more perfectly suited. Your vacation sounded wonderful Anne. Thanks for joining us this week at Sweet Sketch Wednesday!